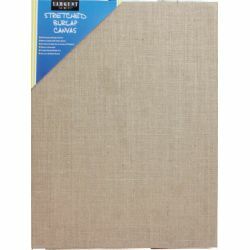 Catalog Home > Stretched Canvas, Burlap, 16" x 24"
Stretched Canvas, Burlap, 16" x 24"
Burlap Canvas accepts a wide range of media, and is coated with clear gesso on the back. Canvas is stapled on the back to a pine wood frame. Suitable for hanging with or without framing.